Recent statistics from the Irish Census about post-Famine Ireland are an extraordinary treasure trove. Most important, however, the statistics also quote extensively from previous Census material, dating back to 1831. Since practically every Census from the 19th century was destroyed by the authorities or in the great blaze that happened at the Four Courts in Dubin on the outbreak of the civil war in 1921, these are the only documents that can show an Ireland that was profoundly different to what we have today. They reveal in cold numbers the impact of the Irish Famine, the greatest human disaster to afflict any country in Europe in the 19th Century. Town by town, village by village, we can track the declining population, the death of communities and the rapid extinguishing of the Irish language as the first tongue of the nation's people. Imagine America going from 300 million people to 100 million, and English dying out overnight as the first language -- and you get a sense of the scale of the catastrophe. From 1821 to 1831, the new figures show the population leaped by over 14 percent in what is now the Irish Republic. 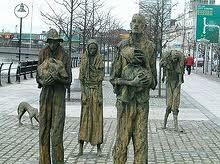 Ireland was approaching its all-time high total of 8 million people on the cusp of the Famine. Ironically, it was the growth of the potato as the staple crop that created this incredible growth. The potato provides enough nutrients on its own to sustain large populations, and Ireland thrived on the alien import from the Andes first brought in as a luxury food for the rich, but soon adopted by the masses. From 1831 to 1841 the population continued to grow, increasing by over 5 percent as the island reached the historic eight million mark. Then came 1845. The Famine blight almost certainly came from an American ship. There had been similar crop failures in parts of America in the two years before, but nothing like what was going to befall Ireland. That winter was wet and extraordinarily long. In the spring the potato crop failed. The potatoes in the fields were black and rotten. "A fearful malady has broken out among the potato crop... the fields are said to be completely desolated. There is hardly a sound sample in. As for cure for this distemper, there is none.." reported one newspaper. That year, one-third of the crop failed. In 1846 one half, and then in Black '47, the entire crop failed. The Census from 1851 reveals the sad facts. The population had dropped by over 21 percent. Entire villages were depopulated, the countryside laid waste. The great trek to America is well underway. It is the hinge of history. Without the Famine, we would never have come to this land, no antecedents of John F. Kennedy, or Ronald Reagan, or Eugene O'Neill. We would have become a European people, with no far-flung outposts from Australia to Canada to the U.S . Our history as a people revolved around those four years from 1845 to 1848, the worst years of the Famine. The decline begins in the Census figures. From 1861 to 1871 the population slumps a further 8 percent, followed by 5 percent in the following ten years to 1881 and then over ten percent to 1891 and over 7 per cent by 1901. All in all from 1851 to 1901 the population drops an astounding 63 percent. In that same time the language dies, side by side with the harvest. The number of Gaelic speakers dropped by over 80 percent. A traveler who visited in 1844 and came back in 1900 would have seen an utterly different land. What the British could not accomplish -- the death of the old Gaelic order -- the Famine did. The new Census figures are an extraordinary account of that historic and awful event.